Empirical and philosophical perspectives on scaffolding that highlight the role of temporal and temporary resources in development across concepts of culture, cognition, and evolution. "Scaffolding" is a concept that is becoming widely used across disciplines. This book investigates common threads in diverse applications of scaffolding, including theoretical biology, cognitive science, social theory, science and technology studies, and human development. 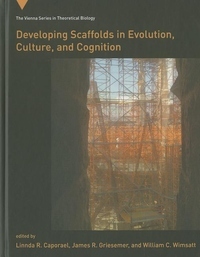 Despite its widespread use, the concept of scaffolding is often given short shrift; the contributors to this volume, from a range of disciplines, offer a more fully developed analysis of scaffolding that highlights the role of temporal and temporary resources in development, broadly conceived, across concepts of culture, cognition, and evolution. The book emphasizes reproduction, repeated assembly, and entrenchment of heterogeneous relations, parts, and processes as a complement to neo-Darwinism in the developmentalist tradition of conceptualizing evolutionary change. After describing an integration of theoretical perspectives that can accommodate different levels of analysis and connect various methodologies, the book discusses multilevel organization; differences (and reciprocality) between individuals and institutions as units of analysis; and perspectives on development that span brains, careers, corporations, and cultural cycles.